Refining its inorganic growth strategy further after carrying out acquisitions in consulting and analytics areas down the years, Cognizant Technology Solutions is understood to be scouting for business process outsourcing (BPO) firms specialising in insurance in the US and Europe. The Nasdaq-listed company is looking to acquire companies handling back-office operations for US and European clients, primarily in insurance support and related operations, according to an investment banker who spoke on condition of anonymity. Such a move is expected to strengthen Cognizant’s insurance practice, which has focused primarily on the property and casualty insurance industries. Cognizant is understood to be targeting BPO firms with revenues in the $5-50 million range this year. When asked, a spokesman said the company was always open to new acquisition possibilities, but declined to comment on any speculation to that effect. Within the ambit of property and casualty insurance, Cognizant has been offering back office and front office solutions in the areas of claims processing, document management, policy administration, regulatory, reporting and solution frameworks, among others. Most of the 85,000-plus employees and 50 development centres of Teaneck, New Jersey-based Cognizant are in India. The company, which offers BPO and consulting services, is seen by analysts as one of the key beneficiaries of the sharply rebounding $60-billion Indian outsourcing market. Cognizant’s net profit for the quarter ending March 31 rose to $151.5 million (Rs 660 crore), up 34 per cent from a year earlier and 5.2 per cent quarter-on-quarter. Revenues for the first quarter rose to $959.7 million (Rs 4,222 crore), up 28.7 per cent from $745.9 million (Rs 3,278 crore) in the first quarter of 2009. Revenues in 2009-10 are expected to be at least $4.1 billion (Rs 18,860 crore), up by at least 25 per cent over 2009. Cognizant Technology Solutions Corp plans to hire aggressively through the year as it sees an upswing in demand and the war for talent heats up. The IT services provider's India-based rivals Tata Consultancy Services, Infosys and Wipro have revived hiring after a lackluster 2009. The company also competes for talent with the likes of Accenture, IBM and Hewlett-Packard. "Given that we've revised our guidance, my anticipation is that we'll clearly continue to hire throughout the rest of this year," Chief Executive Francisco D'Souza said in an interview with Reuters. Cognizant's solid first-quarter results prompted the company to project revenue growth of at least 25 per cent for the year. "We've done a lot of hiring in the fourth quarter and the first quarter," D'Souza, 41, said. "We hired 10,000 people in the fourth quarter. We hired about 7,000 people in the first quarter." He added that these were net additions and that the actual hiring was a little higher. On the flip side, the battle for staff is resulting in greater attrition, as employees are finding it easier to switch jobs with the IT industry recovering. Attrition on a trailing 12-month basis was 12.4 per cent, Chief Financial Officer Gordon Coburn said on a conference call with analysts. "Similar to others in the industry, we experienced an increase in attrition during the first quarter," Coburn said. "This attrition was primarily at the junior levels." 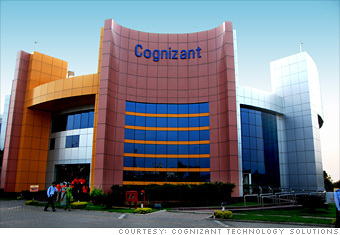 Cognizant has been growing faster than its competitors in the industry. "In the first quarter, on both a sequential and year-over-year basis, we grew faster than all our key competitors. The implication there is that we took share from them or rather expanded our share faster than competition," CEO D'Souza said. The company's strategy has been to reinvest extra dollars into the business to grow the company by maintaining adjusted operating margins within the target range of 19 per cent to 20 per cent. The CEO said they expect to maintain margins at the same level. Cognizant shares, which have more than doubled over the past 52 weeks, were trading at $51.91 Tuesday on Nasdaq.